Megger has introduced the PAT450, a portable appliance tester designed to test portable electrical equipment for safe operation. Said to be ideal for portable appliance testing in locations like service workshops, schools, hospitals, prisons, construction sites, offices, restaurants and sport facilities, the PAT450 can store up to 10,000 test results. It features 10 A and 25 A bond tests with high duty-cycle designed for fast testing, easy operation and all-day use. The PAT’s 250 V and 500V insulation tests protect sensitive electronics. The new PAT450 conforms to the latest European regulations and standards, enabling US companies shipping electrical products internationally to ensure that their exported products will pass import testing. A USB port enables convenient download to a standard USB memory stick. A barcode scanner and thermal transfer barcode label printer can be used with the tester when hooked up to the USB port. A new restart feature on the PAT450 allows the unit to restart instantly from the same menu where it was unplugged when moving from room to room. This saves time, allowing more tests in a single day. 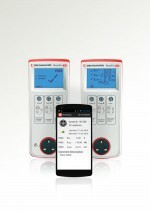 The PAT450 can perform a variety of tests such as an earth bond continuity test that verifies the integrity of exposed metalwork on grounded (Class I) appliances; an insulation test that checks that equipment conductors are isolated from ground to 500 Vdc and a touch current test that powers the asset at the supply voltage as if it were in use. The new PATMobile App from SEAWARD is reported to be specifically designed to extend the performance of the market leading PrimeTest 50 and PrimeTest 100 manual testers by providing easy access to a host of special test data handling options. NETHERLOCKS has received new EX certification for the Netherlocks FAITH Partial Stroke Testing (PST) system, recognising the addition of a dedicated grounding means for the system.